Made For Any Phone (4) ? The best of modern hearing aids, like Audéo™ Marvel, take the experience of wearing hearing aids to a new level. 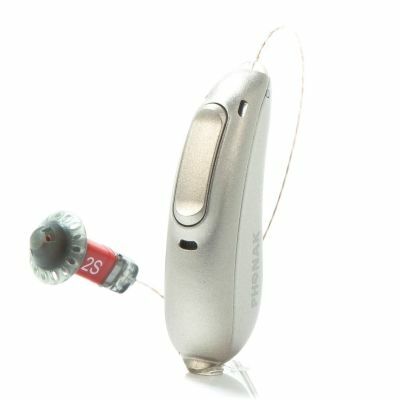 No longer does choosing a hearing aid revolve around the hearing aids alone. Now, it’s the sum of the parts, the total package, the whole experience of using them that matters. Audéo™ Marvel bring an experience that focuses on clear, rich sound, high-quality wireless connectivity, smart apps, and the added convenience of optional rechargeable batteries. Audéo™ Marvel, or Audéo™ M for short, are the first Phonak hearing aids released on the new Marvel platform. Featuring AutoSense OS 3.0 sound processing, they introduce a few new automatic programs, so they sound great in a wide variety of situations. With Bluetooth connectivity for Android and Apple iOS mobile devices, Audéo™ M deliver hands-free phone use in a more refined and battery-saving implementation than their Audéo™ B Direct predecessor. Even better, Audéo™ M are the industry’s first hearing aids that can recognize speech and music streaming inputs, optimizing sound quality automatically. In contrast, other hearing aids put an automatic classifier to work only for sounds picked up by the microphones, and not for wireless streaming. You want a true hands-free phone solution for direct streaming from Android and Apple iOS mobile devices. You want to connect to Bluetooth audio sources other than a sparkling, new smartphone. You would appreciate real-time captioning on your mobile device, with the Phonak MyCall-to-Text app.